Edith Durham (1863 – 1944) was an English artist, anthropologist/ethnologist and writer who travelled and worked in Albania between 1900 and 1914. 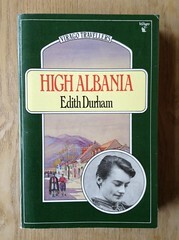 One of those intrepid Victorian/Edwardian female explorers, High Albania is her account of her travels in Northern Albania in 1908, the time of the Young Turks and the end of the Ottoman Empire. Lots of late nights, early mornings, conversations with Albanians and Franciscans, blood feuds, besa and firing of pistols. A perfect read before, during and after our week walking in the Accursed Mountains.